Kings Canyon and Sequoia National Park – Giant Sequoia (including General Sherman and Grant Trees) and Cedar groves, cave tours and breathtaking vistas of the tallest peak in the lower 48, Mt Whitney, are just a few of the highlights to satisfy your inner John Muir from two of the oldest National parks in California. 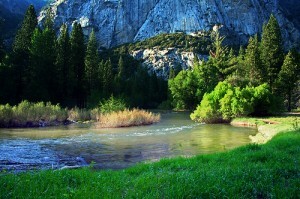 Kings River Trail – There is a seven mile stretch of the trail that has really great views of the Kings. If you are looking for a backcountry trek, there are several nice swimming holes and various undeveloped campsites along the river. For a sweeping view check out the off-road panoramic lookout at the top of Delilah Mountain. Some of the road parallels the South Fork of the Kings River. Boyden Caverns – Good 45 minute walking tour for young and old. Canyoneering and rappelling are now available. The caverns are open mid-April through mid-November. Crystal Caves – The half-mile trail to the caves takes you past some pretty nice waterfalls along Cascade Creek before entering the cave. Tickets are not sold at the caves. They must be purchased in person at the Lodgepole or Foothills Visitor Centers in advance of the guided tour. Tours begin in May.